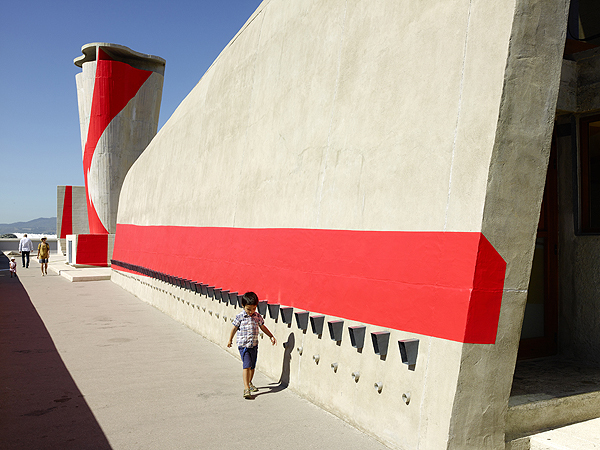 Felice Varini was born in 1952 in Locarno, Switzerland. He now lives in Paris. 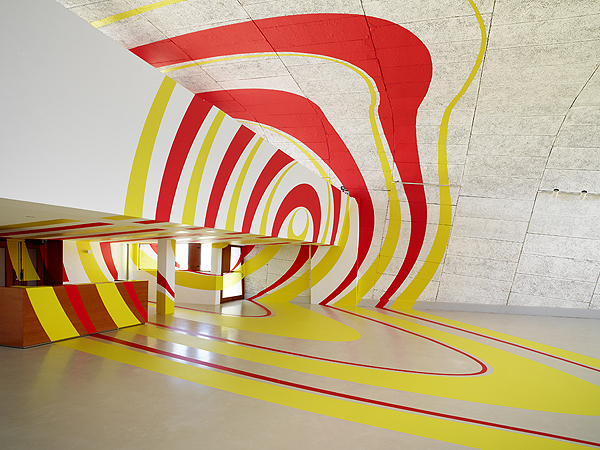 He operates in situ in a different place each time and as a result his work evolves in relation to it. 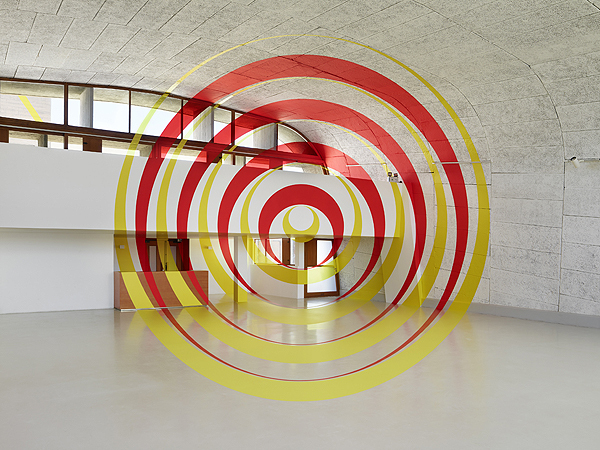 “I generally scour the venue taking in its architecture, materials, history and function. Based on its varying spatial data, I define a viewpoint around which my initiative takes shape. For me a viewpoint is a point in the space that I choose carefully: it is usually situated at my eye level and preferably located in a key passageway, for example where one room leads to another, a landing, etc. I don’t make a rule of it, as spaces don’t all systematically have an obvious path. The choice is often arbitrary. MAMO: an open-air place for artistic creativity. 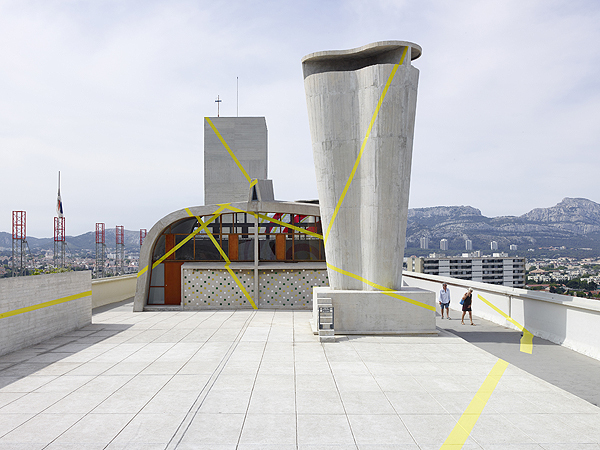 Located on the top of La Cité Radieuse built between 1945 and 1952, MAMO is an art centre created by Ora Ito in 2013. 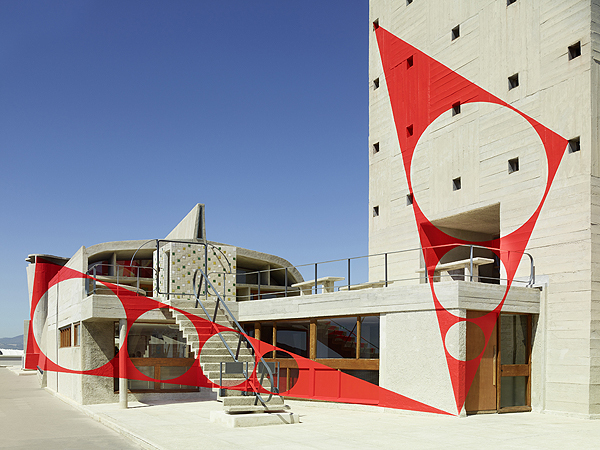 Le Corbusier’s masterpiece has therefore become a setting and springboard for contemporary creation. 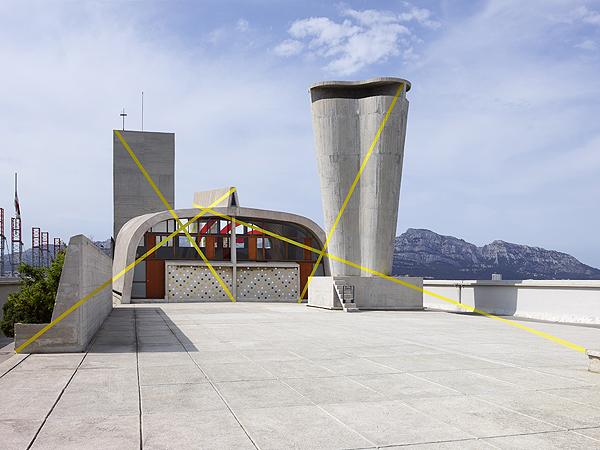 Xavier Veilhan, Daniel Buren, Dan Graham and now Felice Varini are the first artists to conceive works in situ on this historic roof terrace where the Corbu spirit inspires, impels and diffuses. MAMO short for Marseille Modulor, and MAMO short for Marseille Main Ouverte, the infamous open hand designed by sculptor Le Corbusier, produced after his death and located in Chandigarh in India blessing MAMO. It welcomes, grasps and helps creativity and artists, also taking all audiences by the hand. Ora Ito is an all-rounder and brilliant creator. He is an altruistic born agitator with a passion for shapes, addressing substantive concerns: how do we make living together easier? How do we foster enjoyment, sharing and culture? Ora Ito has lived between Paris and Marseille for 15 years and with MAMO, he wishes to build bridges to enable enjoyment and encounters.